This month’s theme for the Fill the Cookie Jar group I’m in is Valentine’s Day. Although I have a heart-shaped cookie cutter, I decided to use the colors of Valentine’s Day for inspiration. I couldn’t decide on pink or red so I decided to do both! The benefit of choosing two different colors is that I also ended up with two very different flavors to satisfy the palates of all my cookie samplers. 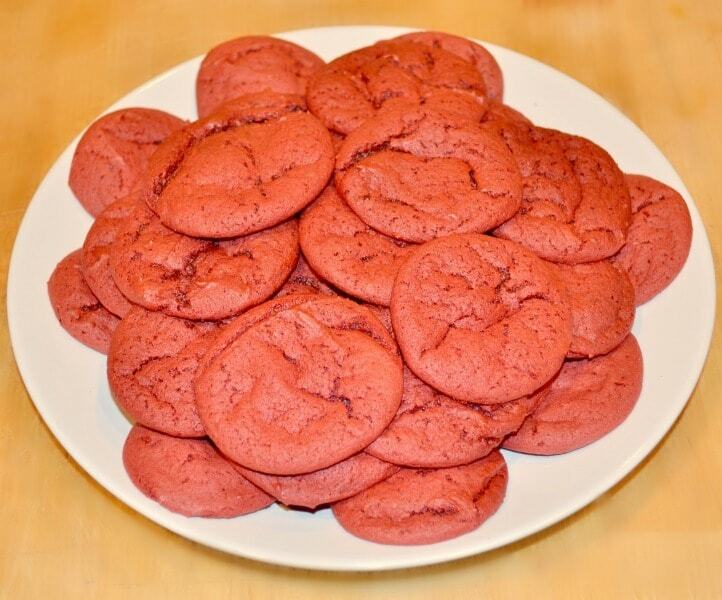 The best part about this recipe for Cake Mix Valentine Cookies though, aside from the fact that I was able to create two cookies of different colors and tastes, is that it’s SO easy. Three ingredients. Three steps. This is truly a recipe for Wondermom Wannabes. Very little effort required to make a very good impression. These cookies were a hit with every single one of my samplers, none of whom guessed or could believe that they were made from cake mix. 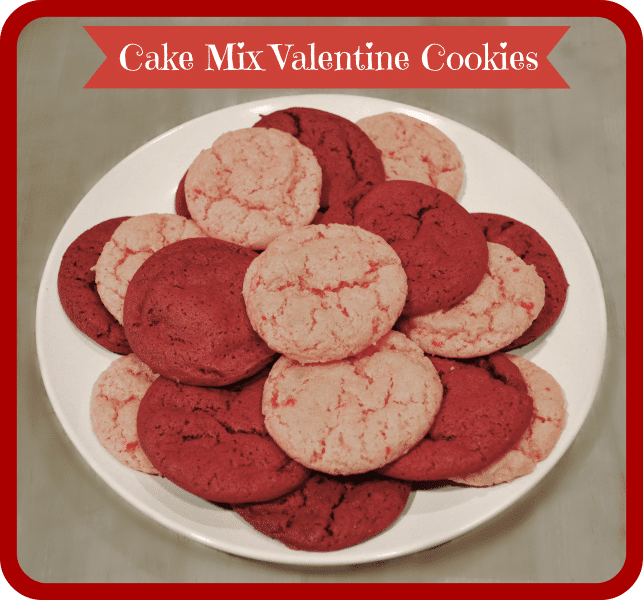 Box of Cake Mix — You can use any flavor, but to get the Valentine colors I used strawberry and red velvet. After I delivered a batch to my BFF, she recommended that as long as I wasn’t going for the healthiest cookie award, I might as well slather on a layer of frosting and stick a red and pink cookie together. I aim to please! 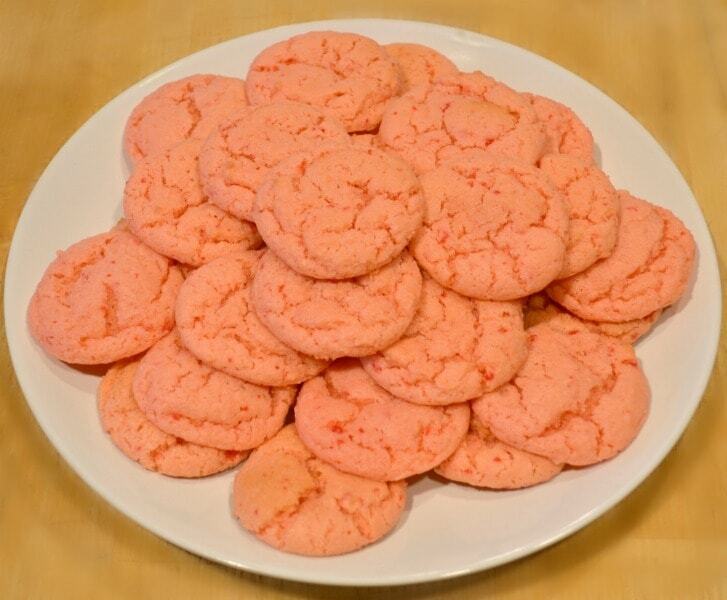 Check out the other Valentine’s Day themed cookies from the other ladies in the Fill the Cookie Jar group. They’re a talented bunch of bakers so you should find plenty of pin-worthy recipes. I would never think to use cake mix for cookies! 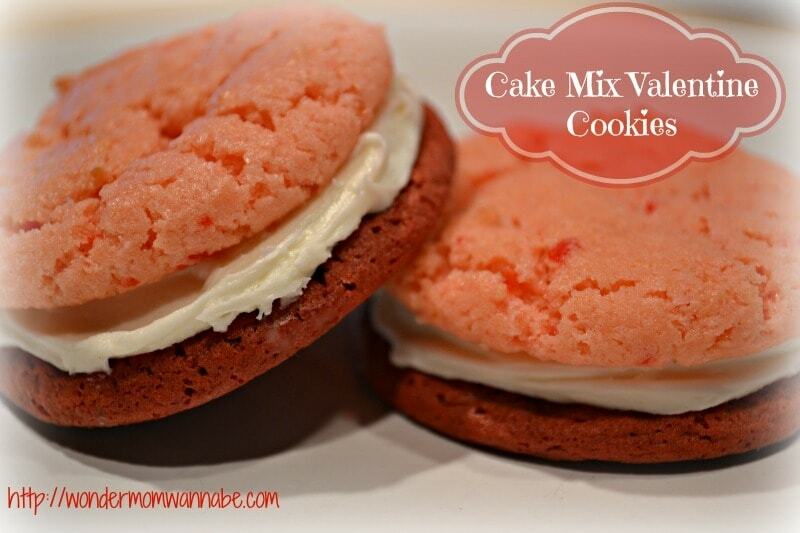 And love how you added frosting to make them kind of look like whoopie pies. YUM! How festive and *sweet*! Thanks for linking up with Mommy Monday Blog hop! I love that you chose strawberry and red velvet. They are two of my favorites. I love the filled cookie too! Who wouldn’t love this ‘sweet treat’ for Valentine’s Day! I was lucky enough to have a sampling of these along with my family (thanks Corinne) and it was cool that some liked the red velvet, and others were loving the strawberry. I’m loving the strawberry, mostly because it’s such an unexpected flavor for a cookie, they smell devine, and they are soooo soft. Great job! Oh, my gosh, I LOVE what you did with these! I was already impressed with the two different colors, and then BAM! you put them together! 😀 Fantastic! These look delicious and so easy to make! Perfect for Valentine’s day! Thanks for sharing a recipe. These look so yummy! Don’t you love how our BFF’s can come up with a way to take our creations to the next level!? I’m with your BFF and adding frosting makes these heavenly! Great minds think alike! I made cookies using a cake mix also! They are so quick and easy and great tasting. Thanks for being a part of the Fill The Cookie Jar group!